Elizabeth Anne Weddings: these are a few of my favorite things.. It's march! :) I feel like my spirit is doing a little dance today as I bask in the melting snow and birds that chirp by my bedroom window every morning! Have you heard their singing? It is breath to these tired winter bones. 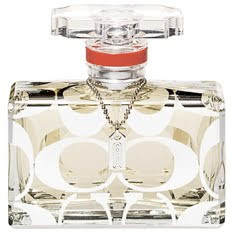 COACH PERFUME. oh my goodness. bless those who created this scent and why have they been keeping it from my senses? Shame on them whoever they are. As I walked through Bloomingdale's last week my eyes plopped upon this scent. Curiously I sprayed on my wrist and as I whiffed it in I found myself instantly reaching for another spray to dose on me! This time though I sprayed it on my scarf so every time I wear my purple chiffon I delight in it's fragrance. Until I can afford, I will find satisfaction in this method! hehe! Have you caught a whiff? Do you love?! BIRDCAGES! 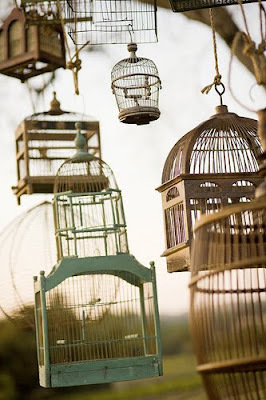 I have always looked at birdcages as fun objects to decorate with outside but it was a client of mine, Shirlee, who really drew my eye to them and added a new light. She is fairly obsessed and will openly admit her room is cluttered with them as she prepares for her September wedding. Her finance gaily laughs at her obsession as my eyes twinkle with delight at their cuteness. So now I find myself looking for them and loving their unique designs. Isn't this picture super fun? I'm loving. More to come in the coming days, my friends. What are you finding joy in these days? Do share!